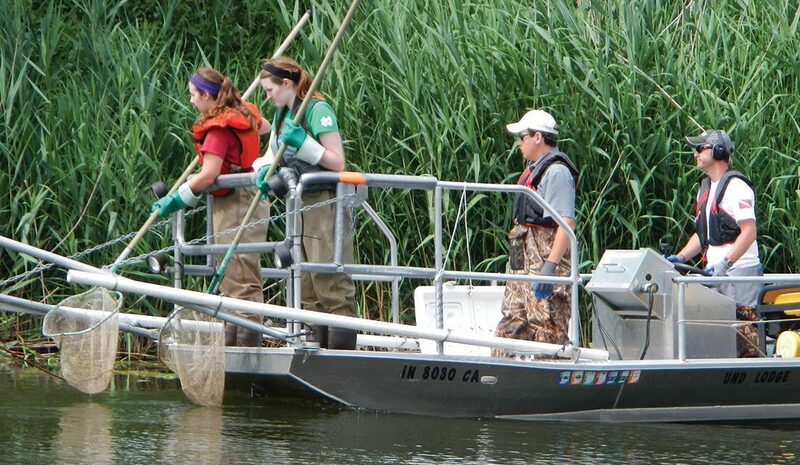 University of Notre Dame researchers use electroshocking to collect fish data in wetlands of Burns Harbor in Indiana. This story appears in Lake Michigan nearshore food web: Charting new waters, a new publication created by Illinois-Indiana Sea Grant and Wisconsin Sea Grant. While the influx of invasive species has taken a toll on the Lake Michigan food web, the loss of habitats like coastal wetlands may be having impacts too. Researchers who are looking at how coastal wetlands contribute to lake habitats have, thus far, documented that various fish species like yellow perch and smallmouth bass use these wetlands at various points in their lives. Biologists Gary Lamberti, University of Notre Dame, and Patrick Forsythe, University of Wisconsin-Green Bay, are leading a team whose goal is to quantify the role of coastal wetlands in sustaining sportfish. The project is in progress, but is making promising steps forward. 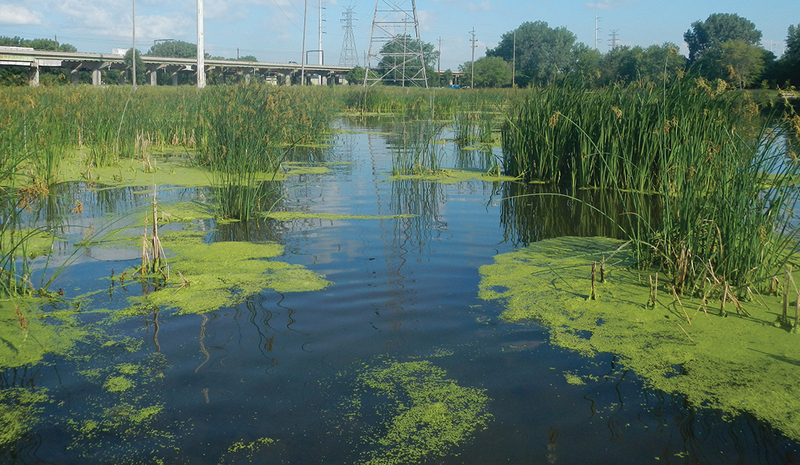 They are building the food web in wetland and nearshore habitats at nine paired wetland-nearshore sites around Lake Michigan, with the wetlands representing a variety of landscapes and distances from the lake. The scientists are using three measures from 50 species of fish, both prey and predators, to map out the story. The first two measures are commonly used—carbon and nitrogen stable isotopes. Carbon isotopes reveal location in terms of food source. It reveals what the base of the food web looks like. The newly restored Roxana Marsh in Indiana provides a study site for assessing the importance of wetlands to Lake Michigan sportfish. “In a wetland, carbon cycling happens faster than in nearshore waters so the carbon signature is more depleted and that gets propagated up the food chain,” said Katherine O’Reilly, who has taken on this work as part of her doctorate at Notre Dame. The nitrogen isotope indicates where a species sits in the food chain and can reveal what species are more predatory and are eating other fish versus those that are primary consumers, eating solely invertebrates or zooplankton. 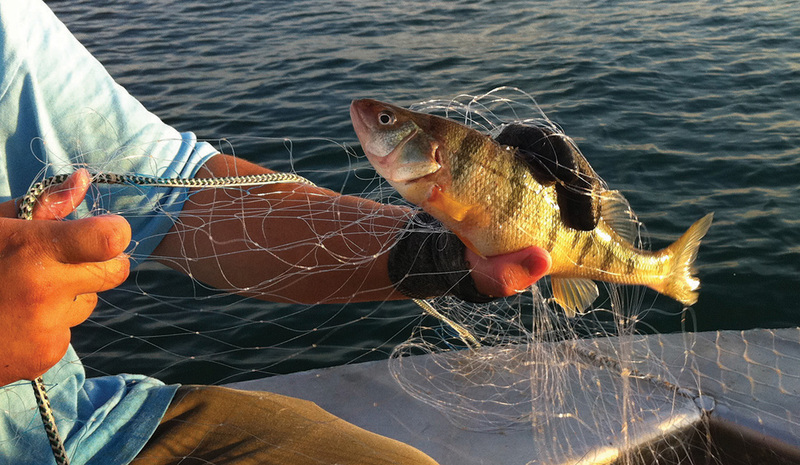 Nearshore areas, including wetlands, may play important roles to yellow perch and other sportfish. The third measure is a technique first pioneered in marine studies. The researchers are analyzing trace element chemistry of otoliths, which are fish ear bones. Since they are always growing, otoliths provide a timeline of where the fish have been. As analysis progresses further, the researchers will be able to understand more about the connection between the two habitats. Ultimately, they are hoping to demonstrate the value of wetlands to the lake food web and sportfish. “The question might need to be answered: How much is a wetland worth to a fishery?” said O’Reilly.